Welcome back guys, Day #3 of Winnie & Walter Nov release project share today. Hope you enjoyed and got inspired by my day #1 and day #2 projects. Today I have a one layer card for you and lots of ink blending. 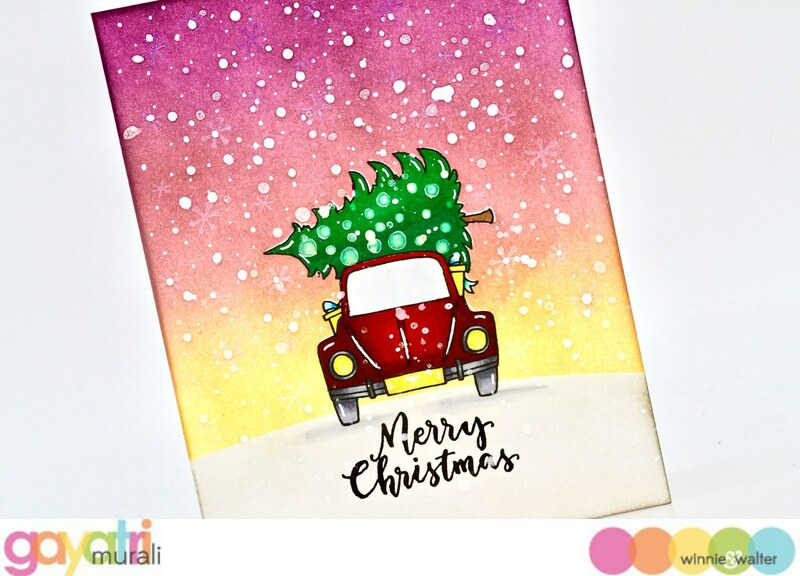 I used the new Snowy Holiday with Evelin T Design stamp set to make this card. Since I don’t have the cutaways for this stamp set yet, I decided to make a one layer card. I really love making them. So I started with stamping and cutting the image on masking paper to make the mask. Then I stamped the image on the card front using copic friendly ink. I masked the image as well as the bottom portion to ground the car. Then used distress inks to sponge the background. The colours I have used are Scattered Straw, Spun Sugar, Victorian Velvet and Seedless Preserve. Then I removed the bottom mask and masked the sponged area to sponge Tumbled Glass and Iced Spruce distress inks. Then I removed the mask off the stamped image to colour the image with copic markers. Details were added using white gel pen. Then I stamped the sentiment from the same stamp set below the card using Versafine Onyx Black ink. Then I splattered the entire panel with white and iridescent spray from Altenew. I also stamped the snowflakes images from the stamp set using white pigment inks. 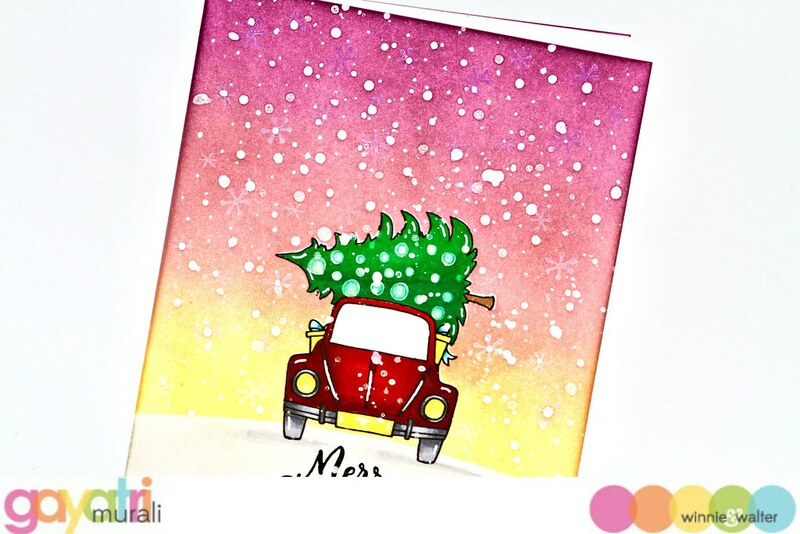 To add texture to the card, I used white Nuvo crystal drops to add more snow on the card. This finishes the card. Here are some closeups of the card. There are so many images on this stamp set to create many fantastic scenes for one layer card. 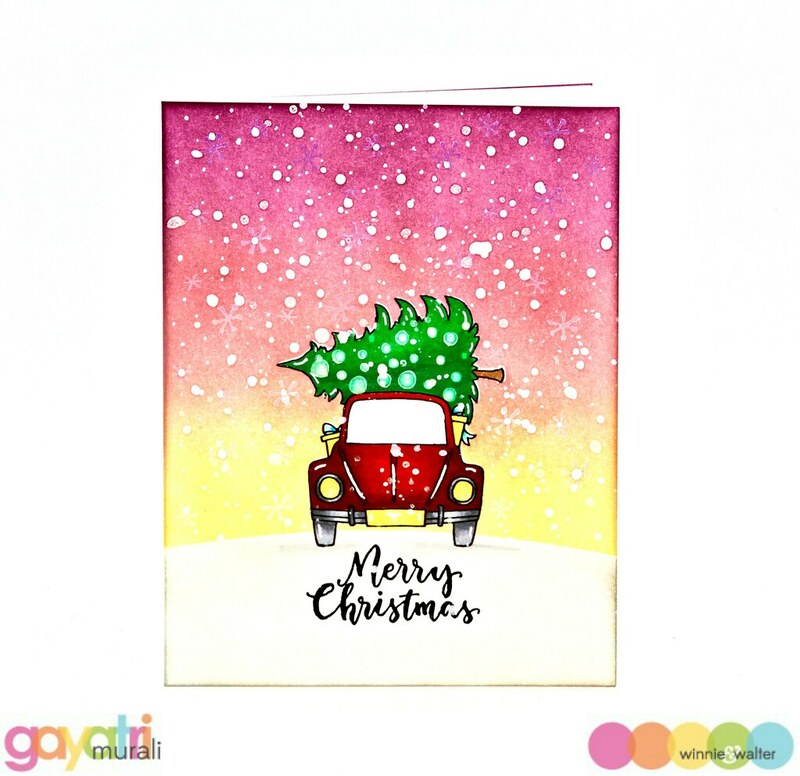 I will share more later in the month before Christmas 🙂 Hope you got inspired by my card today. Check out Winnie & Walter Blog for more design team inspiration as well as giveaway details. I will see you tomorrow with day #4 sneak peek project. Thanks so much for taking the time to visit my blog post.